One of Michael Aaron Gallagher’s greatest passions is Latin American art and culture. Some of the finest paintings in his collection include works by artists from across the region. 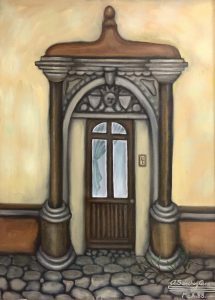 “La puerta colonial 4″ by A. Sánchez Cisneros, painted in Mexico in 1988. Often, Michael will select a piece of art based on a personal connection he has with the work, only later to discover it was painted by a well-known Latin American artist. Another example was a pair of small oil paintings he purchased, which were titled “Girl with a water jug” and “Gypsy girl in a red dress” by artist Maria O’Dell. She explained that the paintings were originally inspired by photographs she saw online. 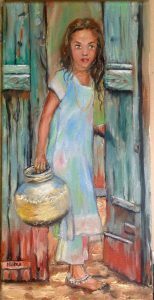 “Girl with a water jug.” Oil painting by Maria O’Dell. 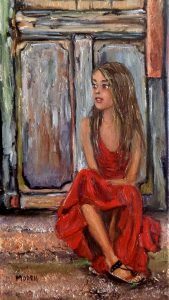 “Gypsy girl in a red dress.” Oil painting by Maria O’Dell. O’Dell, who signs her works MODELL, is best known for her mermaid paintings, which are sold in seaside gift shops along the East Coast of the U.S. 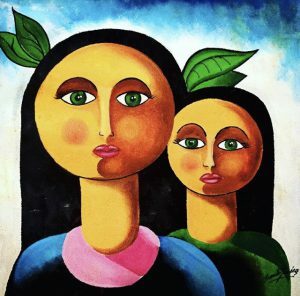 Paintings by Latin American artists are a primary focus of The Michael Aaron Gallagher Collection, as it continues to celebrate the beauty and diversity of artistic ideas across Central and South America.